Over the years there’s been a lot of debate among magicians, especially online, over books versus videos. Indeed there’s been so much debate over the subject you sometimes find yourself wondering if magicians just like to argue. I personally don’t see why it has to be an either or proposition, as each format offers particular advantages. Books engage the imagination. You’re forced to imagine how an effect should look. This can be a good thing as it compels you to put the requisite work into something to make it match that imaginary interpretation, essentially making it your own. Videos, on the other hand, show you how tough sleights should be executed; often seeing something done can make all the difference, as translating timing and smoothness via the written word is not always easy to do. More, you’re afforded the opportunity to see how an effect plays before an audience. It seems to me that limiting yourself to one or the other on the basis of principle is kind of nuts. I guess if I had to choose one over the other I’d take books, mainly because I enjoy reading, and when I started in magic there were no videos. Over the years I’ve read a great number of magic books. Some, not surprisingly, were a waste of time and money. Most have fallen somewhere in the middle ground, offering a viable effect or two or an idea to play with. A few, a very few, I consider to be master works on the subject of magic. If I had to recommend a single book to the serious close-up magician, I’d unhesitatingly suggest the original Stars of Magic. Originally written and released as a series of individual manuscripts, the collected work features effects by some of the most gifted close-up artists of the day, the forties and fifties — artists whose contributions to the art have given them legendary status. People like Dai Vernon, John Scarne, Tony Slydini, Ross Bertram, Francis Carlyle. These are the people responsible for creating modern close-up magic, and I can think of none better to learn from. It’s not just the contributors that make this such a superlative book, however. If the contributors were anonymous any serious magic student looking at the work dispassionately would still have to conclude it contains a wealth of strong practical material. 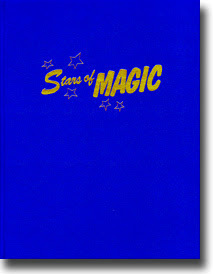 I don’t know if any magic book is completely sans filler, but Stars of Magic comes pretty damn close. The Vernon material dominates the book, just as Vernon the man dominated close-up magic in the twentieth century. Indeed, the Vernon material alone is easily worth more than the price of the book. Effects include the original Spellbound and the original Triumph. Here we have two effects which have spawned volumes of variations, yet I’m not sure if any of them come close to matching the originals’ quiet and certain power. You also get Vernon’s Cutting The Aces, if you’re looking for a flashy commercial wonder, Kangaroo Coins, Vernon’s Ambitious Card, Impromptu Cups And Balls, Mental Card Miracle – are you starting to get the idea? There’s a true abundance of quality effects you can use. Additionally Mr. Vernon has two sections at the end of the book, one devoted to Malini and one to Leipzig. In these he offers some recollections of these two giants and also tips some of their pet effects. Of particular interest is Leipzig’s Opener, a very effective revelation with cards that’s not all that difficult to do. Vernon is not alone in offering great effects, however. Francis Carlyle serves up one of the best effects in the volume, in my humble opinion, with his Homing Card – a brilliant card to pocket that, like much of the Vernon material, is often imitated but rarely equaled. If you do walk around, this is an effect that should be in your repertoire as it’s user friendly and kills. Vernon’s friend and confidant, S. Leo Horowitz, gives us Chink a Chink. The incomparable Slydini tips several wonders including his broken and restored Cigarette Miracle. Slydini also offers a section on lapping – a must read if you ever work sitting at a table. I’m sure there are wonderful things I’m forgetting – it’s just that kind of book. Its small size belies the immensity of material it offers. If you’re serious about close-up and haven’t yet acquired this treasure, do yourself a favor and get it as soon as possible. This is the one book I would heartily recommend without qualification. See you next time. This entry was posted on 3 septiembre 2007 at 5:53 pm and is filed under Magic Classics. You can follow any responses to this entry through the RSS 2.0 feed. You can leave a response, or trackback from your own site.